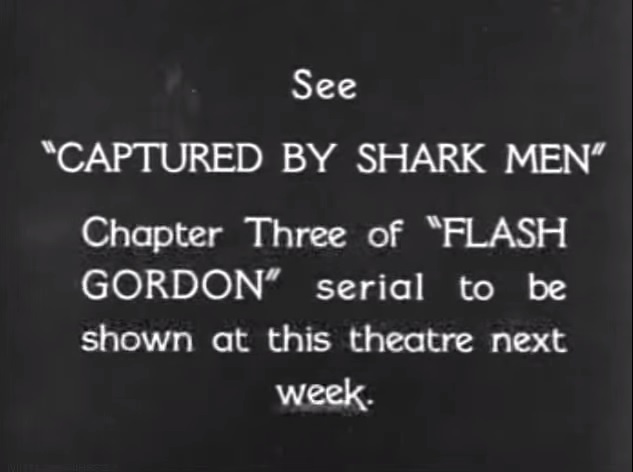 We’re back for the second chapter of our Flash Gordon rewatch. Last week’s exciting chapter ended with Flash and Princess Aura plummeting to their deaths. Thanks to Ming the Not-Quite-So-Merciless’ sudden change of heart, Flash, his partly shredded shirt and Aura are saved by the last minute deployment of a net that breaks their fall and saves them from the “dragon of death”. Thanks to a conveniently located door, Flash and Aura escape the pit and flee to the tunnels beneath the city. Aura is obviously attracted to Flash, but Flash, clearly not the smartest cookie in the jar, is oblivious. Meanwhile, Zarkov is in “a scientist’s paradise” and a wonderful new ensemble featuring a lovely pair of short-shorts. Even more meanwhile, Dale is being prepared for a marriage to Ming. She resists, but Ming’s high priest is unimpressed and heads off to have a chat with the Ming the Now-Merciless-Again. Aura traps Flash inside a rocketship, apparently simply by removing the very short set of steps leading to the ship’s door. Realising he’s stuck, Flash makes the sensible decision to change into some new (and presumably more durable) clothes, including more of those short shorts. Ming’s high priest reports Dale’s attitude problems to Ming who orders that she be hypnotised with the dehumaniser, at least until the end of their wedding. An alarm sounds, warning of the approach of a fleet of spinning tops belonging to the lion men. Flash sees them too and realising his friends are in danger, leaps into action and takes off in the rocketship. In a dramatic dogfight, Flash manages to down one of the lion men ships but collides with a second. The two ships tumble to earth and crash. Thankfully, both the lion man piloting the top and Flash survive the crash. There’s a brief tussle and Flash disarms the lion man. The lion man expects Flash to kill him, but Flash spares his life and explains that he’s no ally of Ming’s, thereby winning the friendship of Thun, Prince of the Lion Men. Thun agrees to help Flash free Dale and Zarkov but Ming’s fleet of rocketships arrive, chasing off the rest of Thun’s ships. Undeterred, Flash and Thun capture a guard and force him to take them to Zarkov who explains that Dale is due to be married. Things are starting to look bleak for Dale as she is hypnotised by the dehumanizer and taken to be married to a very regal looking Ming. Flash and his new BFF head underground to the secret chamber where the wedding will take place. They are met by more of Ming’s guards and Flash is forced to leave Thun fighting them off. As the wedding ceremony inches forward, Flash comes face to face with a “huge beast” that is a cross between a crab, Godzilla and a parrot. The monstrous creature grabs Flash and after a valiant struggle, he falls unconscious! How will Flash escape the giant parrot? Who will save Dale? Is Zarkov good or bad? One thing that struck me in this episode, even more so that the first, was the pace at which plot points are thrown into the mix. Nowadays, Dale’s wedding would be a season finale (and in the 1980 film, it was a pivotal plot point). But back in 1936, it’s hinted at in the first episode and become the core threat to Dale’s safety in the second. Presumably, it’ll be resolved in the third. I think I’m going to start making a list but so far there must have been close to a dozen little plot elements woven into the story and if you’re not paying attention, they’re easy to miss. It will be interesting to see which of them crop back up later and which were just throwaway ideas. And of course, it’s hard to ignore how quickly Flash a) decides to attack the lion men’s spinning tops and b) is able to skilfully pilot a rocketship. That’s how heroes rolled in 1936. 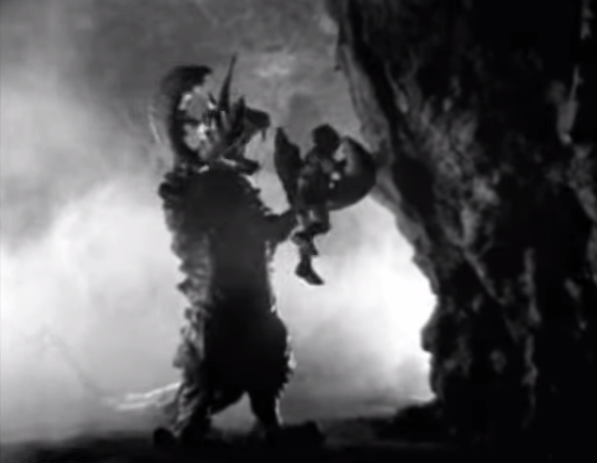 Flash vs The Parrot – particularly the point where the stunt child is brought in to struggle in the creature’s grip. It has to be Ming’s High Priest, if only for the contemptuous smile he flashes Dale when she tells him she won’t cooperate. The rewatch continues next week with Captured By Shark Men. My homage to serials like Flash Gordon, a science fiction novel called Glitch Mitchell and the Unseen Planet, will be released later this year. But I’ll be giving everyone on my mailing list the book for FREE a couple of weeks before it launches. If you’d like a copy, just sign up here – I’ll give you FOUR of my other ebooks right now, as a thank you.